We herewith introduce ourselves as one of the leading manufacturer of process equipments used in Food processing, Dairy Chemical and Pharmaceutical industry, having our works at Vasai, Dist: Thane. MS, India, located near MUMBAI, the economical capital city of INDIA. Our specialization is in the field of blending and roasting system, especially for Spices & Ready to cook type premix foods & fortified nutritious food products. Till now we have more than 300 installations all over the India/Asian Countries. The Roaster machine is a batch type machine, with indirect heating of the product, the heating is achieved by electrical oil immersed heaters using thermic fluid oil as medium, or by using LPG gas heating system or using thermo pack boiler with hot oil circulation system. The Roasting Machine can be used for roasting various types of Powders, Flours, Seeds, Granules, Grain Pulses type products and the idlest machine for preparation of various types of Premix, Snacks foods, Energy Health Foods. The Hot roasted products can be cooled to 45-40 Deg. C through cooling water circulating jacket along with the cooling tower, especially for inline product systems, such as ready to cook items (Upma, Idli, Dhokla, Gulabjamun pre-mix), chilly powder etc. Improves the consistent quality - Auto Temperature setting, Homogenous mixing, No carbonization of Material as the minimum gap between shell & ribbons. Improves Hygienic condition - Minimum hand contamination avoids dusting of Material, all contact parts made of Stainless Steel. Add a few Powders - Colors, Concentrates etc. Add a few Liquids - Essences etc. with Spraying System or oil seasoning of various products. 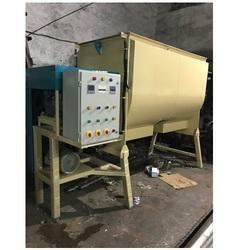 Maida Roasting Machine is a Multipurpose machine, used for roasting, reduction of Moisture contents, increasing self-life of products, for various types of Powders, Flours, Seeds, Granules, Pulses, Semi paste & Gravy type products, used in the preparation of various types of premix, snacks foods and fast moving consumer goods. The heating temperature is controlled through digital temperature controller. The heating temperature can be achieved up to 250 Degree Celsius. For higher batch capacity machines, the heating can be achieved through Thermic fluid heaters using low-grade coal or other fuels such as Paddy husk, Fire wood, Bagasse, agricultural/Bio waste etc. We are leading supplier ofSooji Roaster. The Sooji Roasting Machine is a Multipurpose machine, used for roasting, reduction of Moisture contents from Sooji. Keeping the heating system "Off" the same machine can be used as a blender for blending, mixing various components and by adding a separate spraying system the machine can also be used for adding the small quantum of powders for adding colors, concentrates and liquids for adding Essences, flavors, proteins etc. 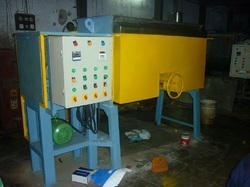 The Roaster machine is used for roasting Sooji, Rava. The Sooji Roasting Machine is a Multipurpose machine, used for roasting, reduction of Moisture contents from Sooji. Keeping the heating system “Off” the same machine can be used as a blender for blending, mixing various components and by adding a separate spraying system the machine can also be used for adding the small quantum of powders for adding colors, concentrates and liquids for adding Essences, flavors, proteins etc. 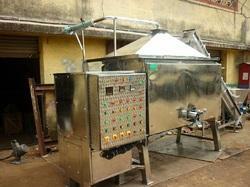 The Roaster machine is used for roasting “Semolina” (Sooji, Rava). 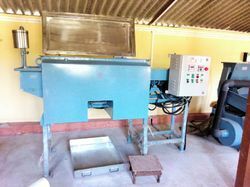 The Cereals Roasting Machine is a Multipurpose machine, used for roasting, reduction of Moisture contents, increasing self–lie of products like Powders, Flours, Seeds, Granules, Pulses, Semi paste, & Gravy type products, used in the preparation of Fortified Nutritious foods, Baby foods etc. Normally in Roasting Machine, the indirect heating of the product is achieved through Electrically operated oil immersed heaters using special purpose heating oil, as a medium. The heating temperature is controlled through digital temperature controller. The heating temperature can be achieved up to 250 Deg. C. For higher batch capacity machines, the heating can be achieved through Thermic fluid heaters using low-grade coal or other fuels such as Paddy husk, Fire Wood, Bagasse, agricultural/Bio waste etc. Besan Roasting Machine offered can be made available by us in different finish configurations so as to perfectly match up with the specific process requirements of the customers. These find use in meeting the demands of food processing needs and meet the demands of blending and roasting system. Offering improved the hygienic condition. 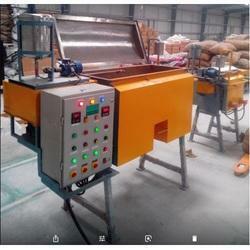 Daliya Roasting Machine offered can be made available in different working specifications and can be made available in different processing volumes as demanded by the customers. Further, these can be made available in different operating configuration choices including in standard and OEM options as demanded by the customers. Sturdy construction finishes for lasting performance.